When I wrote Fiber Gathering, it was an undertaking. It took months of travel, and constant juggling of responsibilities for my professor, so he could manage the photography and his actual work as a professor. We had to hire dog sitters and house sitters and work hard to make it come to fruition. In many ways, it was worth it. I am extremely proud of that work. I look at writing my two books as some of my most important career achievements. I love it when Sammy (one of my twins) says that his mommy writes books in her office. I hope to be able to get back to that reality when the twins are older and I have more time to actually sit in my office again. So, when my publisher, Wiley, sold off parts of its catalog to a different publisher, I took the opportunity to ask if that new publisher would grant me some of my rights back. I am happy to say that my requests were granted. This is all to say that my first pattern download from Fiber Gathering is now available on Ravelry. The Mary Jane Socks pattern is one of my favorites. 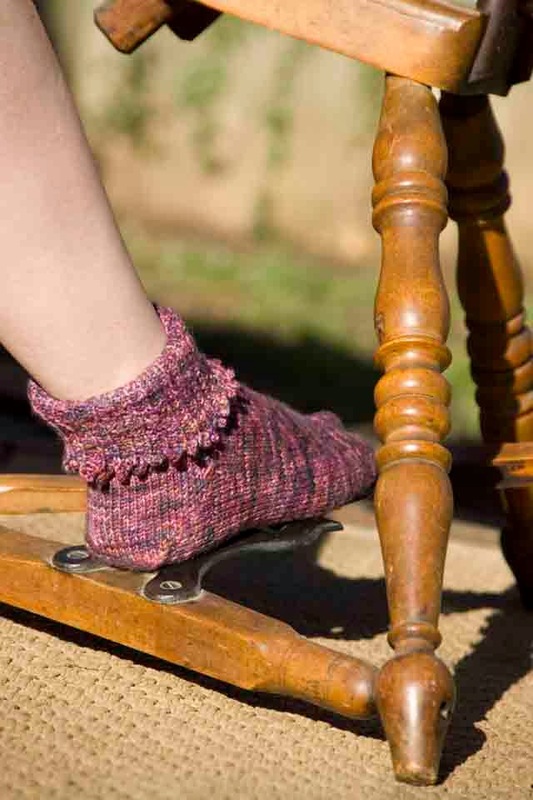 Designed to use every last inch of a special hand dyed sock yarn, this toe-up pattern can also be used for any sock yarn that knits up at the gauge of 30 sts=4". Since the book came out, it has been knit in Patons Kroy and other widely available yarns. I know it is a versatile pattern, and it is one of my favorites. I have worn out 2 pairs of handknit socks from this pattern myself! If you read this blog and tweet, blog, or use social media in some way, I would be really honored if you might pass along the word that this pattern is now available as a download. It is a small step, this one pattern, but it goes towards a long overdue launch of some really hard work. Check out the new Mary Jane Socks download here! More patterns soon, I hope! A few notes from our cold cold last few days. On Sunday, a friend babysat and we went out to eat after the boys went to bed and walked too far in the cold (my idea) and I seem to have a bit of frost nip on my ear. It is red and hot and hurts, but is not white or blistery, so I don't think I will lose my ear or anything. However, no earrings at this time. Just the idea hurt. Monday was another weird ordeal: here is the summary from a note I wrote to my brother. We are under an extreme weather warning, with temperatures between -35F and with windchill, -50. Then, a guy yelled to us as we left preschool that one of our tires was flat. It was. Three gas stations later, we realized all the outdoor air pumps were frozen and would not work. We stopped at a tire place, where the professor dropped me off with the car and he went off to find a bus to the university. I sat there for 2 hours, but now our tire is fixed, and I can pick up the boys. I hope he made it to lecture on time. Did I say it was -50F with the windchill? Oh, and we forgot to turn on the slow cooker last night, so the oatmeal didn't cook for breakfast. I turned it on and it is cooked now. I am eating it now. It is hot. Hot is good. Anyhow, today, I have had a whole morning indoors, mostly on my own, and have made a full meal for tonight. (rice, chicken, salad, the works.) The silence is blissful. I have two things to share. Remember this post? I am posting a photo of the sweater again as I have remade it. I never wore it as this deep v-neck with a zipper and a shawl tie. It didn't work. The sweater was too heavy and yet freezing around the neck. Also, today, I managed to have lunch. It is an open faced ricotta/cream cheese/chutney/eggplant salad sandwich. Again, is this upside down or something? !